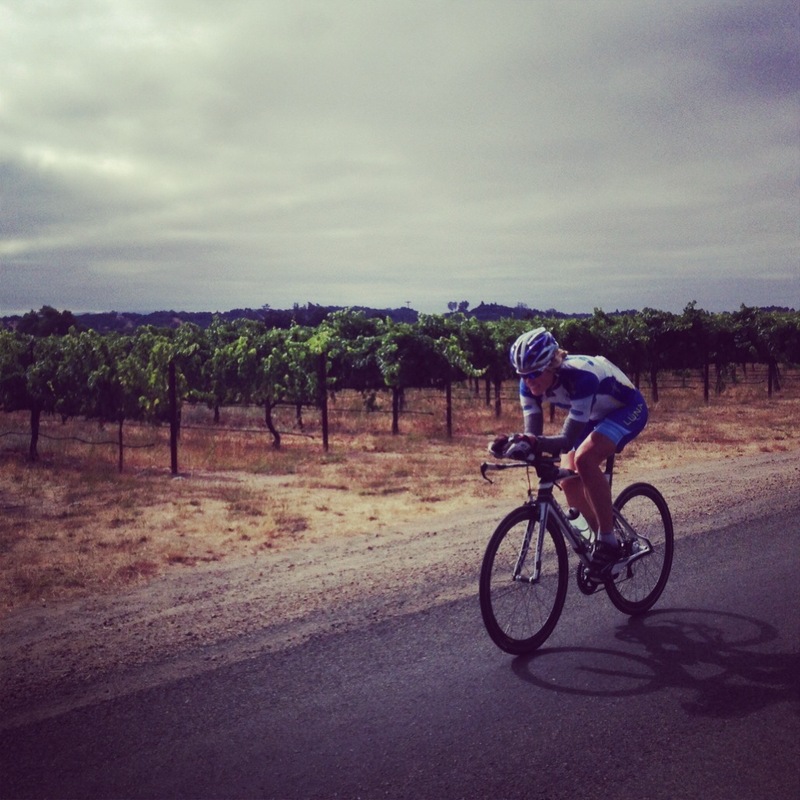 Vineman 70.3: Never, EVER Give Up! After Boise, I was a little frustrated with what I felt like was yet another 70.3 opportunity where I hadn’t reached my potential. I knew I had more to give at the distance, but hadn’t yet been able to tap into it. I’d had okay races at St. George and Boise, but neither one was a day where I really felt like things had lined up and I’d been able to make good on all the training I had done. I wanted to have that day. I wanted to see what I could really do at a 70.3 when I honed in on it and actually gave myself a proper lead-in and taper. I wanted to reach my potential. 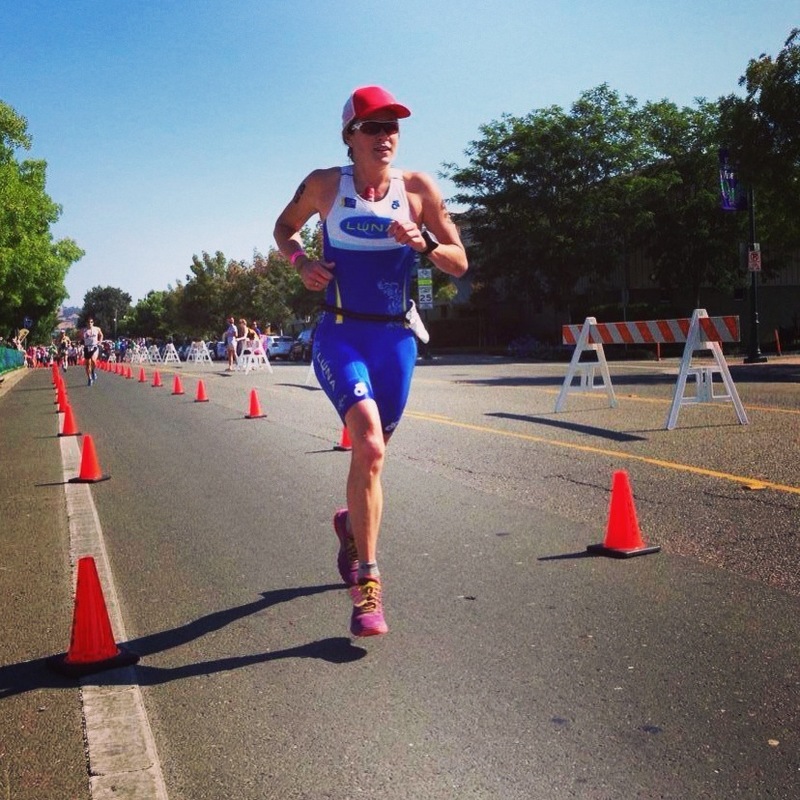 So right after Boise, I made a decision to make Vineman 70.3 my big mid-season “A” race. While some races so far this season have certainly been more important than others, and approached differently, I hadn’t yet really set myself up for an “A race.” I hadn’t given myself the opportunity to focus on achieving success on one specific day. But I’ve done Vineman a few times before, so I know the course, I know it’s a good course for me, and I absolutely love it. It is close to home, and close to my heart. That was where I wanted to do well, and I decided that was more important to me than the other races that fell around it. 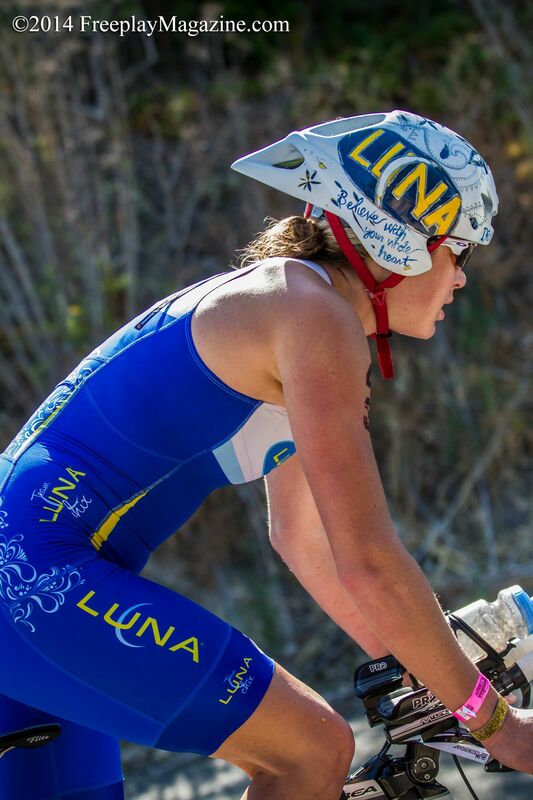 Specifically, the Xterra West Championships in Beaver Creek was just one week later. I knew that creating a mid-season “peak” for Vineman 70.3 would put the Xterra race on the backburner and make me unlikely to perform well there, but I decided with confidence that Vineman was the priority. The Xterra Pro Series is ultimately the main focus of my season, but the most important Xterra races of the year are not until September and October, and I wanted to give myself a chance to feel fresh and ready at a 70.3 before turning my attention over to the dirt for the end of the season. Given this new focus and direction, Coach Aug and I worked on a plan, and I got down to some serious road-tri-training business. I had 5 weeks from Boise to Vineman 70.3, and my biggest priority was improving my TT riding, which had been very lackluster thus far. So other than a few mountain biking sessions leading into Xterra Richmond and then a couple more leading into Xterra Tahoe City, I was as dedicated as can be to the TT bike. There were countless days with perfect MTB conditions, when friends were riding my favorite trails, but I resisted the temptation for dirt and hit the road, keeping my goals in mind. The work seemed to pay off, and I gradually began to feel stronger and more comfortable on the TT bike as the weeks ticked by. Of course, there was plenty of running and swimming in the mix as well, but I’d already put in so much hard work on these disciplines throughout the season, I just had to wait for the gains to start showing up. But I knew I did need to pay more dues on the road bike, so that was what I set out to do. A couple weeks before Vineman, I got to race the Xterra Tahoe City right in my extended backyard. 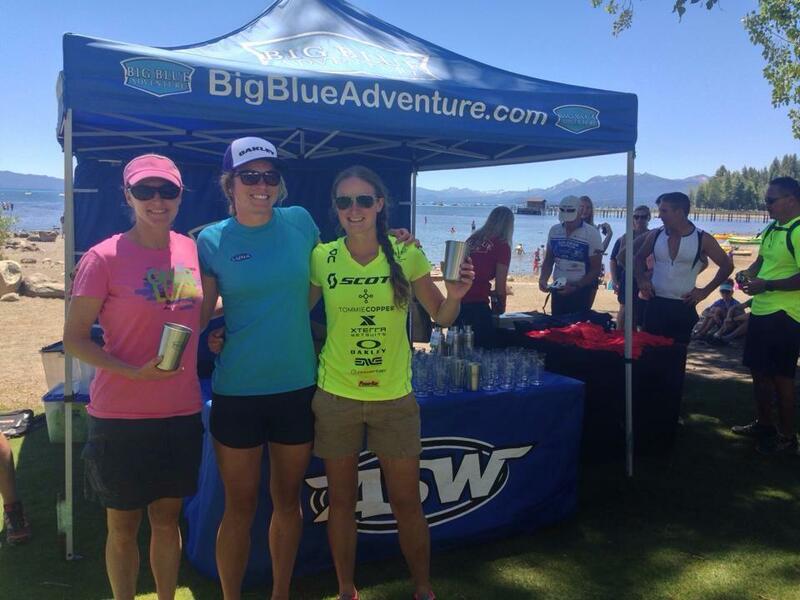 Racing locally is always a treat, and this was one of many incredible events in our area held by Big Blue Adventure, who always do an amazing job. I felt really strong, thrived off the local energy, and took the overall female win. This gave me a much-needed confidence boost after Richmond, and helped to remind me that I am in good form, and fit to keep chasing after all these big dreams! This was an important reminder at the right time, because once again, I managed to pick one of the most elite races possible, and the pro women’s field for Vineman 70.3 was absolutely stacked with champions and “big names.” I felt a little out of my league for sure, but honestly I just put that out of my mind. I told myself to focus solely on my own race and my own goals, which in this case were not related to my result relative to the field. I hope eventually I’ll get to the point where podiums are my focus, but I’m just not there yet as a newbie pro, so right now it’s all about taking the steps I need to keep improving. I Like Swimming in the Russian River! I reminded myself of all of this when race morning arrived and as I once again lined up in the water with some of the best female triathletes in the world. Sure, I would have loved to feel “in the mix” of things, but what I really wanted was just to put together a swim-bike-run effort that didn’t leave me feeling dissatisfied. I really like this swim in the Russian River, and this year was no exception. I did my best to get onto fast feet and swim with a pack, but I had some navigational issues early on and couldn’t quite get on to the main pack where I wanted to be. I caught on to another smaller group for a while but the pace got just a little too hot and I dropped off, which was a bummer. I’m still working on getting better at drafting and hanging in there with other swimmers so I’m not doing so much work on my own. On the way back down the river I ended up swimming with a few different girls at different times, but never really found a group again. I got out of the water near the back of the field, but with several ladies just ahead of me, in 31:15. It wasn’t the breakout swim I was hoping for, but I felt like I did everything I could in the water and I thought I swam well. The day was off to a fine start! Bike Leg: Stuck in the Mediocre Rut! Gorgeous riding in wine country! Photo by August Teague. Onto the bike I had high expectations for myself to finally reach that next level I’ve been digging so hard for. But my body just didn’t have it. The ride started off well and I felt strong, but I couldn’t gain any ground on the couple women ahead of me, and eventually saw them start to slip away into the distance. I stayed focus on my own race and putting together my best possible bike leg. As other riders started to come around me, I did all I could to hang on at the draft-legal distance, and then to keep them in sight. Each time I did so for a bit, but then eventually fell off the back and was left to myself. After several passes, I knew there were no pro women left behind me. I reminded myself not to worry about anybody else and just focus on my own race. But I just did not feel good! As the ride went on, my legs only seemed to feel worse, and I sensed I was getting further and further behind. I poured every ounce of energy I had in to trying to pick up my tempo and increase the power, but it just wasn’t working. It was like I was stuck in third gear and couldn’t get any more out of myself. I felt tired, powerless and completely discouraged. After all the work I’d put in to getting stronger on the bike, I wasn’t showing any progress. I was frustrated and disappointed with my body’s lack of response, and really concerned about how off I felt. My new focus became just getting through the bike and into transition. I just wanted to get that bike leg finished! Nearing the top of Chalk Hill. Photo copyright Freeplay Magazine. When I finally hit T2, I honestly did not know what to think or feel. I was super discouraged by how bad my body had felt on the bike and the fact that I had still not managed to cut my bike time down (2:45:24) — and actually biked a bit slower than I did here last year! I was also discouraged knowing I was way off the back of the field (I got a split that I was the last pro into T2 by over 6 minutes! Ouch!). I was off the pace, my body felt drained, and when I took my first few strides off the bike, my legs literally felt like led. Things were not looking good! I honestly thought really hard about calling it a day right there. A Breakthrough Run, and Why I’m SO Glad I Didn’t Give Up! That certainly would have been easier, but my heart just wouldn’t let me give up. I reminded myself there was a lot of race ahead and I still had every opportunity to have a good run, and could even still notch an overall time PR. I hadn’t had the ride I was hoping for, but it was in the same time range of my other rides this year, and coupled with a solid swim I was actually still on track for a personal best if I could get my legs to come around for a fast run. Based on how I felt heading out of transition this didn’t seem likely, but this is where I had to do a complete 180 in my head. I had to turn my thoughts around and throw out all the negatives of how the day was shaping up so far, or how far behind I was, and focus on the opportunities in front of me. I had to open my mind up to the positives and rise up to the meet the moment. 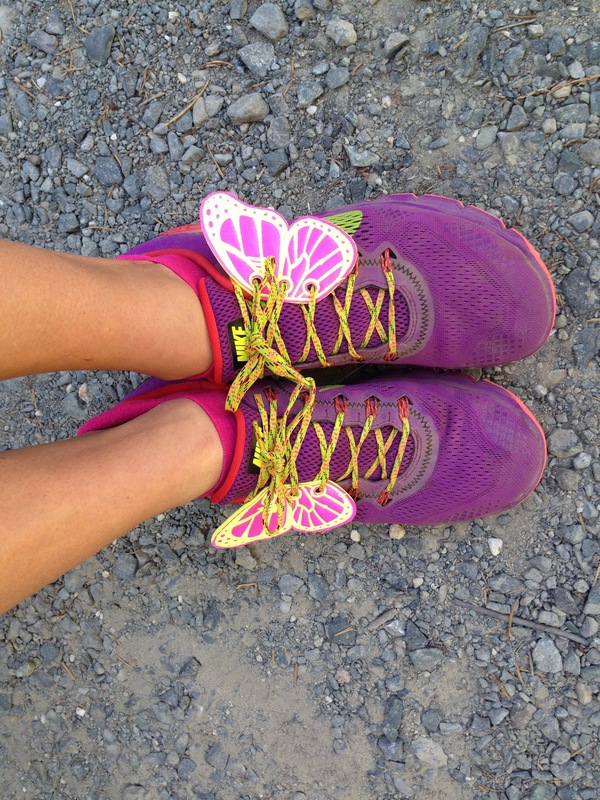 These wings helped me FLY! I couldn’t believe how much my body had turned around since the ride, and as the splits just kept on coming I honestly was a little bit in awe of how strong I was able to run. At mile 1, I’d come in contact with one of the amateur males who was pretty much dead-on evenly matched with my pace. He hung on when I caught up and we ended up running stride-for-stride basically the entire remainder of the run. Normally I really don’t like running side-by-side with someone, as it makes me feel a little anxious, but in this case it was actually great. He was super respectful of my efforts and my space, and rather than feeling like I was dragging him along or vice versa, we ended up essentially becoming a team out there. We were just so well-matched that neither one of us could create any distance between one another, and frankly I didn’t want to. It turned out to be really beneficial to have someone else out there to share the experience with, and anytime I started to get a few steps off the pace, I was able to see myself dropping back right away and start picking back up – and vice versa. I felt really fortunate to have such great company! That definitely kept me pushing hard, and kept my foot on the gas through a few tough miles to start the back half of the run. Other than those couple miles were my pace fell off just a bit, I was able to keep the tempo going and stay surprisingly strong. I’d been chipping away at my time gap to some of the other pros, and when we got to the out-and-back section I could see several of them not too far ahead. Then eventually, after the turnaround, I could see one within reach just in front of me. While this race was really not about who I beat or didn’t, focusing on catching up to the gal in front of me just provided that extra bit of motivation and tangible incentive to keep the pace high in those last few miles when things really started to hurt. When I hit mile 11, I was down to about a 15-20 second gap, and I’d brought my pace way back down. By mile 12, I was within 10 seconds, but I just could not seem to close that gap. I was giving it everything I had and I truly didn’t think I would be able to do it. I nearly gave up on the idea of making a pass, but as we neared mile 13 with the finish just around the corner, I told myself I had to go for it or I’d regret it, and I tapped into a gear I had no idea I had and just let loose every last ounce of energy I could muster. I made my pass literally in the last 2 minutes of the race, and didn’t look back because I was too afraid. That extra push definitely helped me kick it in, and I was SO thrilled to see I had run a 1:29:31 – a lifetime best for me! My previous PR in a 70.3 run was 1:35, and I hadn’t even broken 1:30 yet in a straightup half-marathon, period. So this was a HUGE breakthrough for me, and I was psyched! Honestly, I felt like that run has been a long time coming, as I’ve been putting in the training for it and seeing the splits for a sub-1:30 in my interval sessions, but it just hadn’t transferred over to a race until that point. It felt SO good to finally see the gains transfer over! My total time for the day was 4:50:51, which was also a PR! Good stuff. I finished 18th out of 21 pros (including 2 DNFs), and 19th overall as there was one blazing fast amateur who beat all but 9 of the pro women. Post-Race Perspective and A Big Day Ahead! Initially I felt a little conflicted with my emotions about this race. While I was totally psyched about the huge progress on the run, I was really bummed I hadn’t had a better bike, because I’d been working so hard for it. I felt mixed about the outcome of the race. But having had more time to sit on it, I feel really happy about this performance. I didn’t make the progress I was looking for on the bike. But I finally had the breakthrough on the run that I’ve been seeking – and knowing I could achieve – for a very long time now. And because of that, I was able to achieve a total time PR, which is always something to be proud of. It’s PROGRESS! Sometimes it’s hard to be patient when you expect a lot of yourself, but it takes time to make gains in this sport, and you can’t just expect to make a huge jump each time you toe the line (especially as often as I do!). 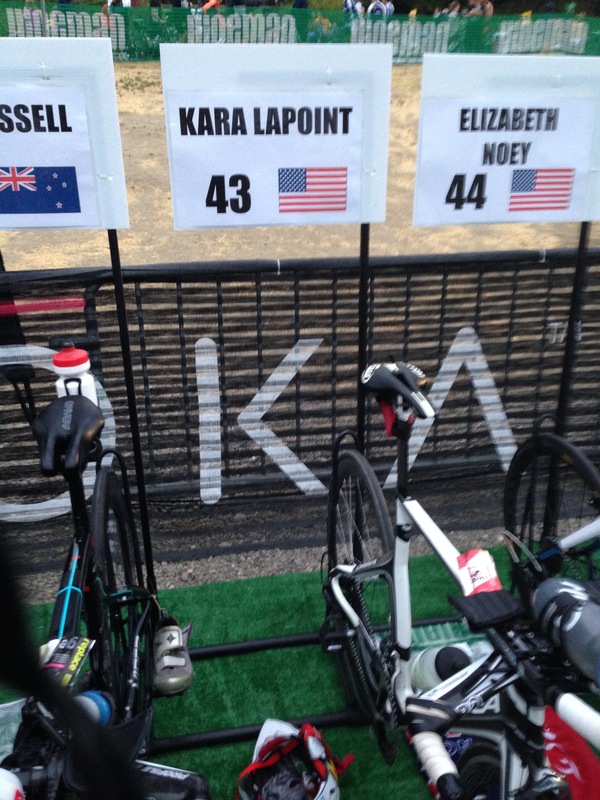 I’ve brought my 70.3 time down in every race so far this year, and that is certainly a trend to be excited about! Do I still want more? Yep! But I know I will find it in due time. It’s tough to feel stuck in a plateau with my bike leg and be so far off the pace of the other pros, but I felt that way forever on the run… posting the same times over and over despite knowing I had more in me. And then – BOOM! – I finally got over the hump and took off a huge chunk of time. I think the same thing will happen eventually on the bike. I just need to be patient, trust in the process and all the work I’m doing, and know I will get there when I’m good and ready. The good news is, triathlon is not just about a bike leg, or a run, or a swim – or a weakness or a strength. It’s swim-bike-run and it’s all about how well you can put the three together at the end of the day. And in this case, I am proud of the way I executed that combination. I struggled a bit in the middle, but I managed to do what I needed to do to come off the bike and have the best run of my life, so something must have gone right. But what I am by far most proud of on the day – and the most important lesson I learned – was that I was able to turn things around for myself mentally after the ride, and carry on with confidence and belief in the opportunity ahead. This was such a great reminder to never give up on yourself, because you never know what is going to happen! I came into the run SO far off the back, but when the day was done I felt like I was way more “in the mix” of things than I have been in any other pro road race this year, with several women within just a few minutes ahead of me. I am so glad I was able to stay in it mentally and keep pushing, and I will take that lesson with me for next time for sure! So, not the perfect race yet, but a pretty darn good one. And while I was able to dig super deep for that PR, I put myself in quite a hole going into the Xterra Mountain Championship at Beaver Creek, and my body did not pull up in time for the race. I suffered big time there and had a very poor performance (race report to come…). But, after some MAJOR rest this past week, I’m now on the eve of my first shot at 140.6 since last fall! Tomorrow I’ll take on the full Vineman, and it is sure to be an epic day. I honestly have no idea what to expect, as is always the case with Iron-distance racing. But, I’m keeping an open mind for whatever lies ahead, and I’m ready to embrace all the challenge and adventure the day is sure to bring. Most importantly, I will remember not to give up on myself as long as there is still opportunity between me and the finish line. Because, after all, anything can happen!